In 2014, I donated $1 from the sale of Kindle books to Water.org, the charity co-founded by Matt Damon to bring clean and safe water to communities worldwide. The goal was to provide clean water for life to 25 persons. 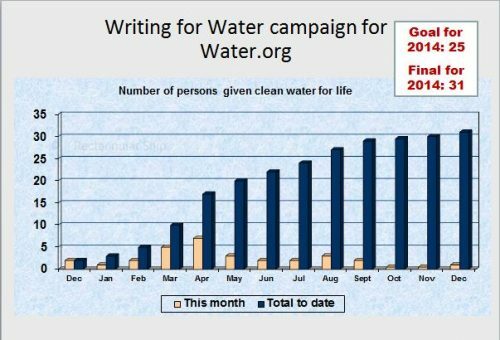 The year-long campaign was called Writing for Water. Every month in 2014 I tracked sales using Amazon’s KDP author dashboard and calculated how many Kindle ebooks I sold. I did not count giveaways, freebies, or print sales. In some months, when I ran a sale on a Kindle edition, the net profit on a Kindle edition could be less than $1. Didn’t matter. A sale was a sale and equated to $1 in donations. I created fundraiser pages at Water.org’s website to explain what I was doing, showcase other authors who were participating, and submit my donations via credit card. At first I’d hoped to create a 12 month fundraiser on the site, which would have been a handy link to promote, but Water.org only lets you do it for 90 days at a time. I also created a Writing for Water page on my website to explain what I was doing, plus a monthly blog post to track progress and hold myself accountable. Enough money was donated to Water.org to provide 25 people with clean water for life by August 2014. Sales slowed after that, due to changes in Amazon’s distribution streams. Overall, the year ended with 31 people able to gain access to clean water for life. I didn’t realize how much time and effort it was going to take to promote other authors, promote the effort, promote our progress, and try to grow participation. I should have done some research about how the best fundraisers are promoted and planned out the effort before January 2014. Beyond social media, the most useful thing I did was to send out a free press release which garnered a nice exchange with the folks at Water.org. I also mentioned the effort in a couple of different author interviews. But I should have had a list of things to do and been more consistent and focused. An unexpected complicating factor was that Water.org only creates 90-day fundraisers when I wanted the fundraiser to last 365 days. This meant that I had to track when a fundraiser ended, change all the links on my pages, and create new ones. Then I ran into problems when I unwittingly created one fundraiser using my Facebook profile and another using my Twitter profile. 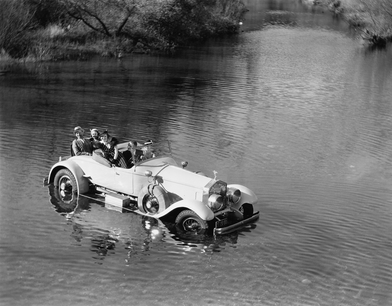 In short, it was a structural problem that added to the workload. It could have been partially mitigated by using a dedicated campaign calendar, much like a blog calendar. When I asked other authors to join me, six pledged to help. Three followed through and we cross-promoted each other in a mutual effort to boost sales. The other three were never heard from again. A 50% opt-out rate is disappointing but probably not surprising given today’s overcommitted world. But it would have been nice to at least get a note saying they weren’t going to participate after all. The non-participating authors had responded to a call I posted in a Facebook or Goodreads author group. We didn’t have a personal connection beforehand. Maybe that is the point. The three authors who responded were terrific: Norm Hamilton, author of BY THINE OWN WELL; Jerry Last, author of the Roger and Suzanne mysteries; and Sharon Lee Johnson, author of a string of ebooks including the ME VS ZOMBIES stories. Subaru uses charitable donations as a means of building its brand and making purchasers feel good about the car they buy. I wasn’t sure if the same should/would apply to books and why readers purchase them. Bottom line, I don’t think my donations to Water.org made a difference to book buyers. Nor did readers flock to this blog to hear how the campaign was going. I met the goal, with a little help from friends, but didn’t sell in numbers big enough to warrant a Big Event or even a new Water.org YouTube video. Was the campaign too low key? Maybe. But it felt strange to be all promotion-y. I’ll continue to support Water.org, because it’s a critical mission. But I know that if I want to finish the next Emilia Cruz novel, as well as a couple of other writerly projects, I can’t do a big campaign again. Instead, I’ll contribute on my own schedule, without using Water.org fundraiser pages. I also won’t use Kindle sales as the yardstick. I’ll be expanding distribution beyond Amazon in 2015 so my income and accounting are in for some changes. But no matter how much I’m able to donate, it will make a difference. Whether they know it or not, so will my readers. Throughout 2014 I am donating $1 for every Kindle book sold to Water.org, the charity co-founded by Matt Damon to bring clean water and decent sanitation to communities worldwide. A number of other emerging authors have helped me out, including Norma Hamilton, Jerry Last and Sharon Lee Johnson. Together we are Writing for Water. As I noted in the October Writing for Water update, the advent of Kindle Unlimited brought Kindle sales to a screeching halt. It’s a good thing we’d met our goal of bringing clean water for life to 25 people in 2014 already because even that low bar would have been impossible in this brave new world of borrows vs sales. November saw us move the bar only half a notch. But when added to the year’s progress, this means that 30 persons have gained access to clean water for life from our efforts. To try and end the year on a high note, all of the Emilia Cruz novels, CLIFF DIVER, HAT DANCE, and DIABLO NIGHTS, featuring the first and only female detective on the Acapulco police force, will be reduced to $1.99. The $1.99 sale will run until Christmas. Stock your Kindle now for wintry weather reading in January! It’s a trip to Acapulco, where the weather is hot but the crime will burn you. Look for the new book covers in March 2015, along with a blog redesign to match! Throughout 2014, I’m donating $1 for every Kindle book I sell. Other authors are joining the Writing for Water effort and togethe we have raised enough to provide 29.5 people with clean water for life through Water.org. Our goal for the year was 25. 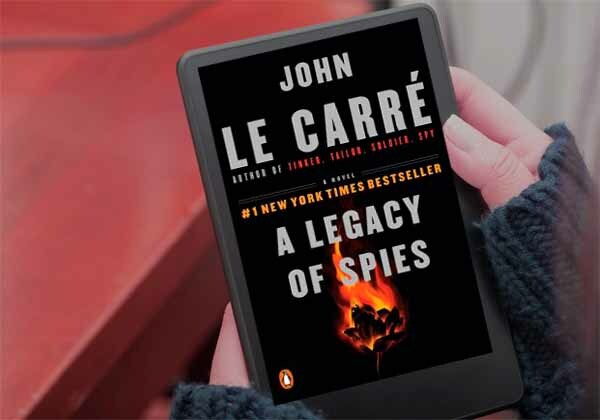 In late September, Amazon rolled out the Kindle Unlimited program, which enables people to borrow Kindle books similar to the way the Netflix or Oyster entertainment subscription plans work. While all of my books are enrolled in the program at present, the borrowing calculation means an author doesn’t get paid until at least 10% of the book is read. Check it out here. Great for readers but it meant that my Kindle sales dropped. As in dead. In. The. Water. 10 books sold all month. This means that, even by stretching my numbers, we only added a bit to the chart for October. Really, really glad we hit our goal back in August. Hopefully November will be a little better. There are just two months left in 2014 and deep down, I was hoping we’d hit 50. I know that won’t happen but we should at least be able to say that in 2014, 30 people gained access to clean water because of a handful of indie writers who decided that their books could make a difference. Even while slaving over my NaNoWriMo effort, I’m going to try and jumpstart sales in November with some advertising and a Goodreads giveaway of the new paperback version of DIABLO NIGHTS. A big shoutout to Sharon Lee Johnson, author of those addictive zombie tales, who continues to send me encouraging messages and checks to Water.org. Sharon has an amazing work ethic and I truly appreciate how committed she has been to the cause of clean water. Read her stories like Zombies Invaded My World. Throughout 2014, for every Kindle book I sell, $1 is donated to Water.org, the charity co-founded by Matt Damon to bring clean and safe water to communities worldwide. 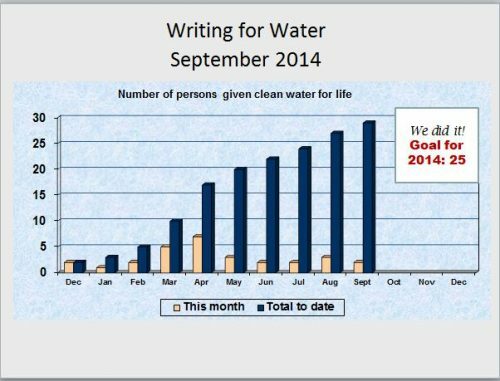 Other independent authors have joined in and every month I tally up how many people have been given access to clean water because readers like you bought our books. September sales flagged for me, after some fairly good Kindle sales months during the summer. But the mistress of zombie tales, Sharon Lee Johnson has promised a check so we managed to bump the ticker upwards by two. 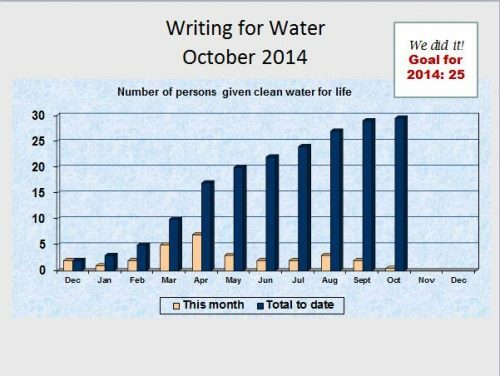 This brings to 29 the total number of persons who will gain access to clean water from the Writing for Water team’s efforts so far in 2014. Given that we started with a goal of 25 for the year, this is pretty good. But if we put all the people who read on one side of the equation and all the people who need access to clean water on the other side, we could be doing alot better. According to the UN’s world population calculator, by 2015 there will be 1,132.5 million people living in high-literacy areas of North America, Europe, Australia and New Zealand. 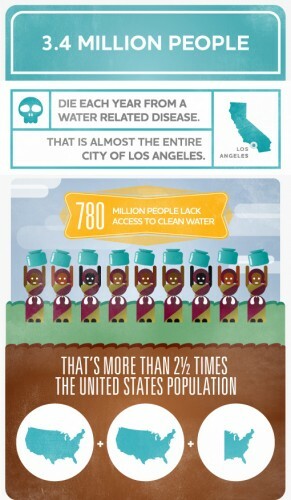 But there are 345 million without access to clean water, according to Water.org. And that has serious consequences. 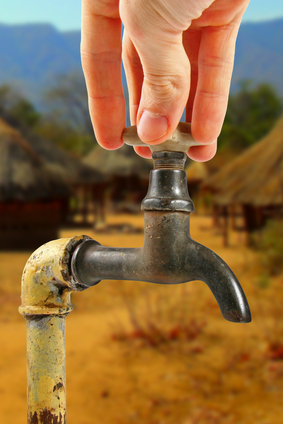 Would the Ebola epidemic be happening if more people had access to clean water in west Africa? Most reports point to lack of basic sanitation as the reason why it has spread so quickly. 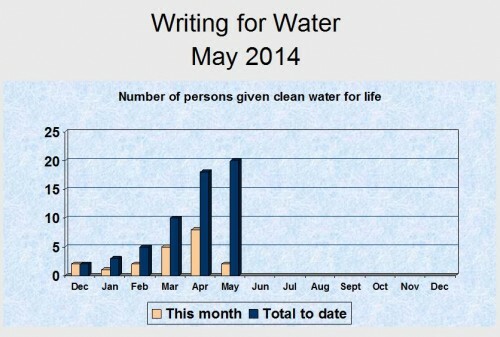 As we head into the last 3 months of 2014, the Writing for Water campaign is going to get aggressive. I’m going to talk about this until I’m blue in the face. Tweet about it, sing it on Facebook, pin every water-related image I can find on Pinterest. And ask readers to do the same. Alot. 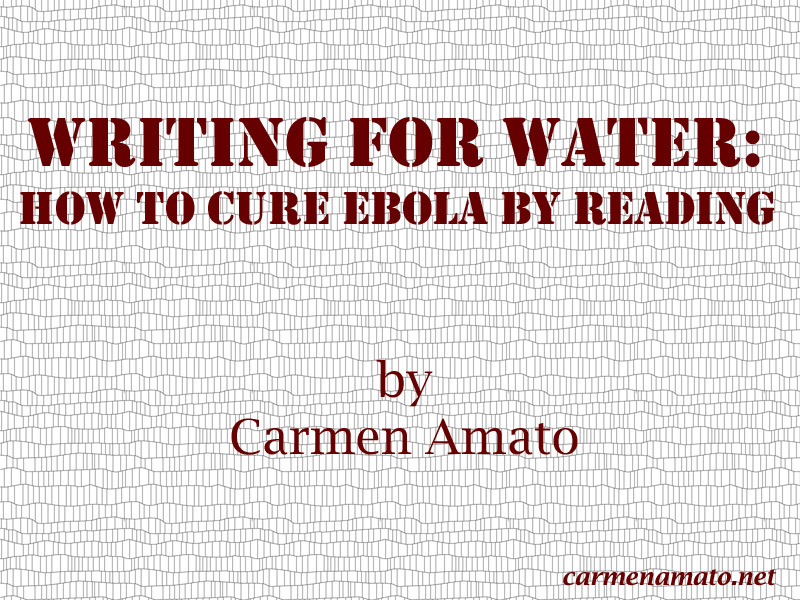 If you are an author, please make a contribution to the fundraiser and then email me at carmen@caremenamato.net. In return I’ll tweet, sing, and post about your books to my 2000+ Facebook fans and 4000+ Twitter peeps. 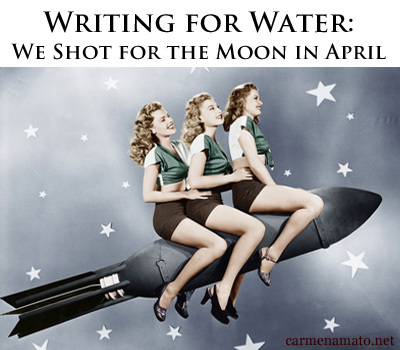 Remember, it’s a simple equation: You can check out all the Writing for Water books here. Buy one, read it (leave a review, please) and know that you helped bring clean water to communities that need it most. Maybe you aren’t ready to put on a Hazmat suit and head to Africa, but you can make a difference! It’s almost a tidal wave. 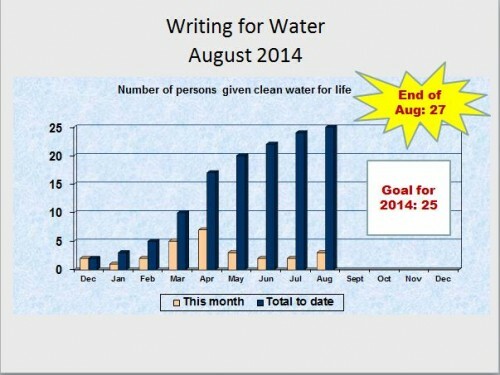 As of 30 August, the Writing for Water team of authors exceeded the 2014 goal of providing 25 people with clean water for life, via donations to Water.org. Author donations are based on book sales. 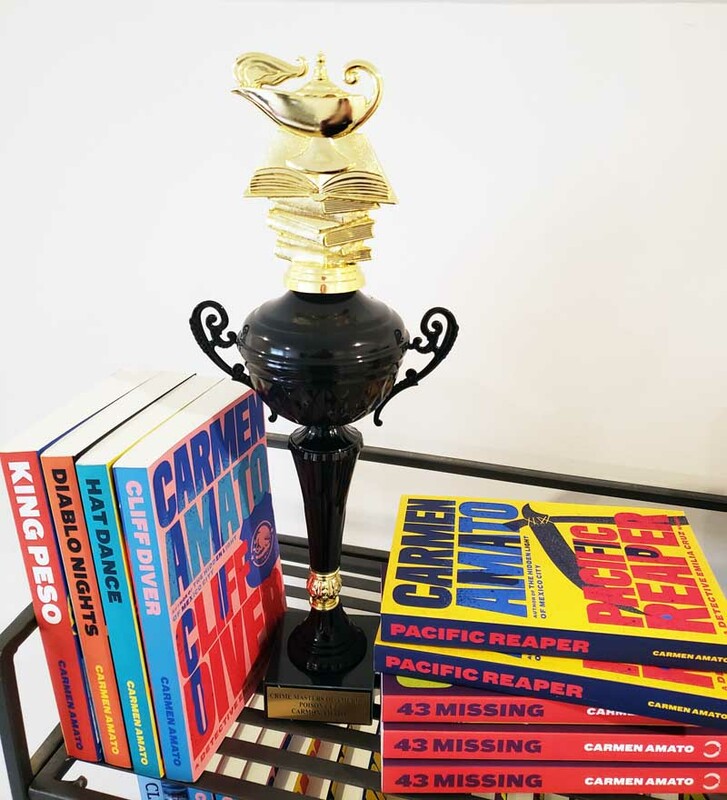 In August, led by strong sales of the third Emilia Cruz mystery, DIABLO NIGHTS, and Sharon Lee Johnson’s zombie tales, we donated enough to give 3 more people access to clean water for a year-to-date total of 27. That’s two more than the goal for the entire year! But it doesn’t mean the end of the campaign. There are alot more than 25 people in undeveloped parts of the world who need access to clean and safe water. I’m really curious to see how high we can go. Thirty? Looks like that will be easy. Forty? Maybe. I’m not going to jinx things by setting a new goal, but I hope you’ll watch the numbers with me through the end of the year. For a little encouragement, here’s a short video by John and Hank Green, aka the Vlog Brothers, talking about Water.org and the worldwide water crisis, complete with child mortality statistics due to lack of clean water. You may recognize John Green as the author of THE FAULT IN OUR STARS. Thanks again for helping authors contribute to Water.org’s mission. Readers like you are the heart and soul of this effort. When you read, someone gets access to clean water. You are the ones turning books into water and for that I truly thank you. 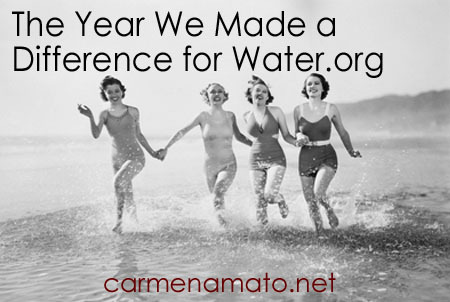 Throughout 2014, I’m donating $1 for every Kindle book I sell to Water.org. Every time someone buys one of my books, they help bring clean water to communities worldwide. Some terrific author friends have helped along the way. 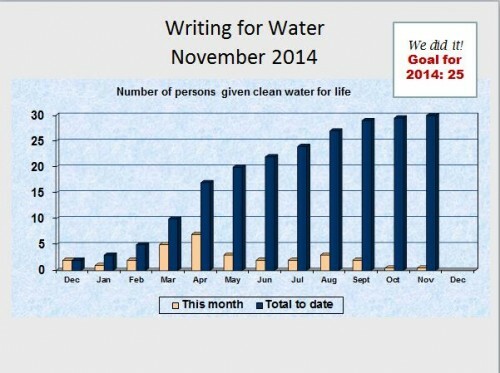 Every month I tally up how many more people have been given clean water for life by this effort. This post combines June and July. In June, I was busy getting ready for the release of DIABLO NIGHTS, the third book in the Emilia Cruz mystery series set in Acapulco. Sales were strong for zombie storyteller Sharon Lee Johnson who made a generous donation to water.org that month. Just before June closed, DIABLO NIGHTS was released and boosted sales during the last 2 days of the month. 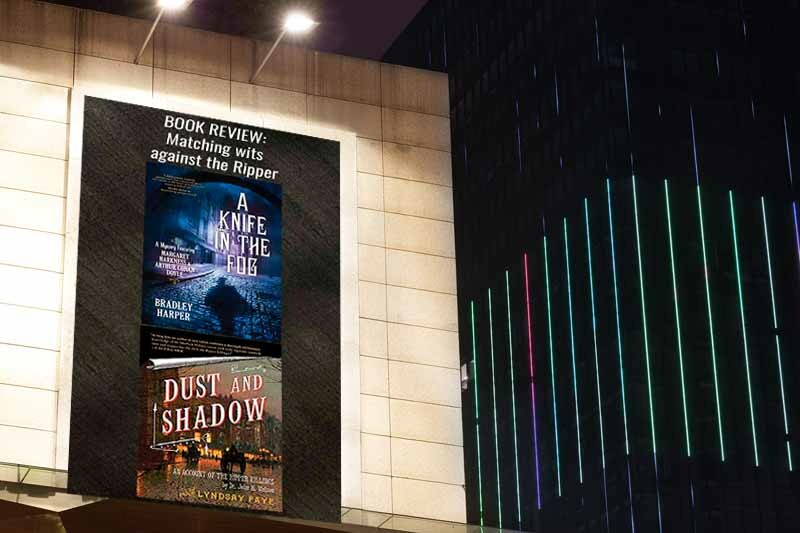 In July, DIABLO NIGHTS kept sales going and the Emilia Cruz series on the Top Rated list for Amazon’s International Mystery and Crime category. The book is currently rated 4.9 out of 5 on Amazon. In 2 months, we provided 4 more people with access to clean water through donations to Water.org! This means that the total tally for 2014 stands at 24, just 1 away from the overall goal for the year! I’m thrilled to think that our book sales are having this sort of impact. Yes, it is small compared to the big supporters of Water.org like Hollywood heavyweights and IKEA, but no contribution is insignificant when it comes to something as critical and basic as clean water. I have said it before but will say it again: It is readers like you who are making this happen. Maybe you enjoyed Norm Hamilton’s fracking thriller FROM THINE OWN WELL, Jerry Last’s Roger and Suzanne mysteries, Sharon Lee Johnson’s addictive zombie tales, or one of the Emilia Cruz mysteries including CLIFF DIVER, HAT DANCE, or DIABLO NIGHTS. By purchasing one of those books, you teamed with the author to make a donation to help bring clean and safe water to communities worldwide via Water.org. Thank you from the bottom of my heart for being part of the Writing for Water team! 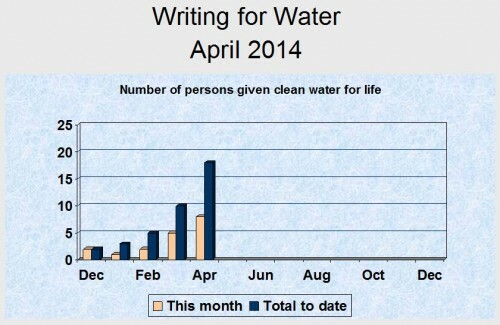 April was a fantastic month for donations to Water.org, based on book sales. Jerry Last, author of the Roger and Suzanne mystery series helped and we really put a dent in the goal of helping 25 people get clean water in 2014. But in May I was on my own, too busy trying to wrap up DIABLO NIGHTS, the next Emilia Cruz mystery and the Bookstores of the Future project, to promote existing books. As a result, monthly Kindle sales weren’t extravagant, which translated into a less extravagant monthly donation to Water.org. Although I know I’ll meet the goal of 25 long before December, in all honesty, May was a big letdown. So I’ll say it up front–if you’re an author who thinks that clean water is critical and you want your books to have a global impact, come help. I’ll help promote your books in exchange for your contribution to Water.org. Read more here. On the bright side, when the last joint fundraiser ended, the nice folks at Water.org sent me an email asking if I wanted the gift of a cool Water.org bottle. Of course I said yes. There are two Emilia Cruz stories currently available free at free-ebooks.net. 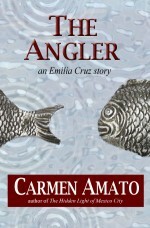 THE ANGLER is based on the 2007 unsolved murder of Fr. Richard Junius, my former pastor at Saint Patrick’s Catholic Church in Mexico City. THE CLIFF is the original Emilia Cruz story, written for a critique group. CLIFF DIVER grew out of that short story. Many readers voted on a poll for their favorite cover for DIABLO NIGHTS. The big review of the Reader’s Choice cover will be on 26 June to email subscribers. If you aren’t on The List, you won’t be the first to know. Fix that appalling situation by signing up below, getting your free copy of THE BEAST, and instantly being smarter and more entertaining. LOL. No, really. We made a big leap for mankind in April toward the goal of giving 25 people access to safe and clean water for life through donations to Water.org. Led by a surge in sales of CLIFF DIVER, the first novel in my Emilia Cruz mystery series set in Acapulco, in April we donated nearly enough from our book sales sales to give 8 more people clean water! 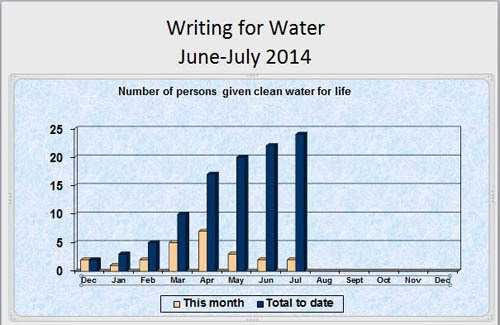 This means that after only 4 months, the Writing for Water campaign has given 18 people clean water for life! I’m amazed, in all honesty. I though that 25 would be a stretch and I’d be thrilled to even get close. But if things keep going as they are–and another few authors join me–maybe we can zoom right past 25 and break the sound barrier. Noise surrounding books and authors: it’s hard to capture readers’ attention. Lots of books and lots of marketing going on. Just because $1 from the Kindle sale of my books goes to Water.org doesn’t make them any more discoverable or enticing to read if you don’t like mysteries. But having Writing for Water buddies promote each other helps. Noise surrounding charitable organizations: I read somewhere that many of us have become inured to tragedy. We see too much on television and online. So we forget that our contributions, when spent wisely, really help individuals. I believe that Water.org spends my contributions wisely with the Water Credit program and working with local communities. Help enough individuals and it’s called global impact. Long before I even published my first book, I knew I wanted to use my books to make a difference. Now it is actually happening! If you are an author and would like to help out any month in 2014, drop me a line at carmen@carmenamato.net. 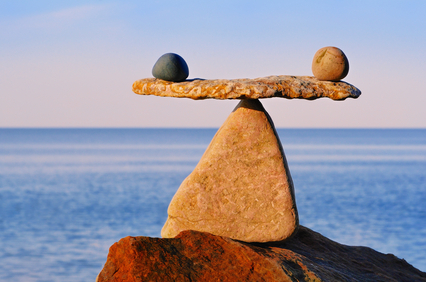 Can a couple of indie authors make a global impact? Yes, and we are doing it. In March 4 authors were part of the Writing for Water team: Jerry Last, Norm Hamilton and Sharon Lee Johnson joined me in pledging a portion of our book sales to Water.org, the charity co-founded by Matt Damon to bring clean and safe water and decent sanitation to communities worldwide. The composition of the team changes monthly. If you are an author and want to pledge a month, please let me know: carmen@carmenamato.net. In 2014 the goal is to provide 25 people with clean and safe water for life. In March we added 5 for a total of 10 so far this year. Our books and our readers are having a global impact! Still small, but as the March stats show, it is growing and I truly feel that our goal of 25 people is going to happen. A big salute goes out to our readers, especially to those who bought Jerry Last’s THE DEADLY DOG SHOW, the best selling title for the team in March. Those who love dog shows and/or German Shorthaired Pointers, will find its behind-the-scenes peek into dog shows and dog training fascinating. Of course, it is a detective mystery so be prepared! Jerry will be part of the Writing for Water Team in April as well. Here’s the link to all the books for the March authors. 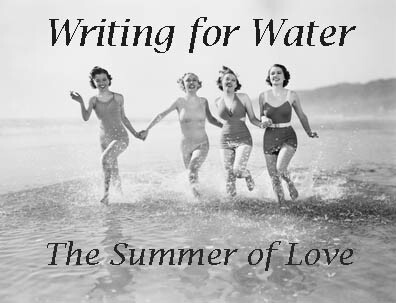 If you are an author and would like to help, please consider joining the Writing for Water team. In exchange for your TAX FREE donation of at least $25, we’ll leverage our social media platforms (3k on Twitter, 2k on Facebook and that’s just me) to promote the heck out of your books for the entire pledge month. When was the last time you got a month’s worth of advertising for $25?? Check out more information here. My next newsletter will have the complete first chapter of DIABLO NIGHTS, the next Emilia Cruz mystery. If you have not yet subscribed, you can do so here, and be the first to read a chapter with a VERY twisted end. I guarantee you will not see it coming. Subscribers also get THE BEAST, the first Emilia Cruz story, plus THE 3 Minute Guide to Great Book Reviews, and my Top 10 Most Riveting International Mystery Series. 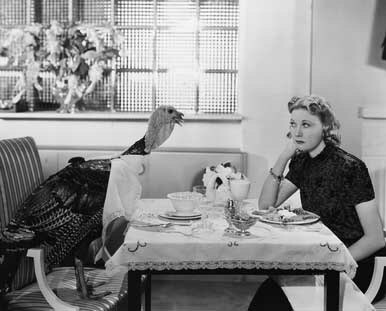 It’s the holiday you and I have probably never experienced. Tomorrow is Water Day. Brought to us by Water.org, Water Day celebrates the day someone gets access to safe water. It’s the day the well or water pump starts working close enough to home that no one risks life and limb to get to it. Getting access to safe water is an event people never forget. 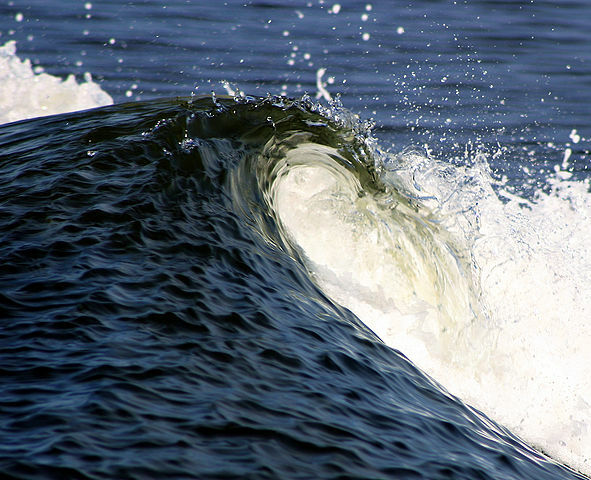 Water.org honors those life-changing events by celebrating Water Day 2014. In 2014, I’m donating a dollar from every Kindle book sold to water.org, because in this day and age, no one should have to live without access to clean water and decent sanitation. This month, authors Sharon Lee Johnson, Norm Hamilton, and Jerold last have joined the Writing for Water team with pledges to water.org. With their help, and other authors throughout the year, I hope to be able to provide 25 people with clean water for life this year. 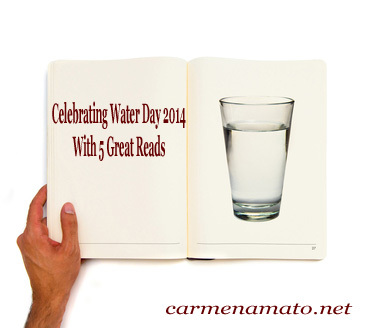 If you’d like to celebrate Water Day and help us out at the same time, please buy one of the books listed here. You’ll be helping an author, plus helping support Water.org at the same time. As an added incentive, many of our books are discounted this month. HAT DANCE, the second Emilia Cruz mystery is on sale this weekend. It’s a dance with the devil and Acapulco Detective Emilia Cruz can’t afford the music . . . Originally published as a 3 part series in the New Yorker in 1962, the book was the first call to action for the environmental movement. A classic. In this novel of a futuristic Canada, the country’s water supply has been destroyed by fracking–and greed. Scarily plausible. An award-winning Wall Street Journal reporter tells the story of the tycoons who have made a fortune through fracking–hydraulic drilling through extremely dense shale made controversial because of the link to contaminated water. The true story of how Hendley, a twentysomething bartender, found himself in Darfur, Sudan, countering the tribal warfare that used contaminated water as a weapon of mass destruction by drilling wells. Fishman explains that we have more than enough water to avoid a water crisis but we have to change our approach to how we use–or save–our water. Inconvenient truths, but solutions, too. Thanks for reading and taking a minute to think about the importance of access to safe and clean water. Happy Water Day. P.S. Come along on this writing journey with me and get a free short story. THE BEAST, the first Emilia Cruz story is free when you sign up for monthly updates including exclusive excerpts, book release news, and progress toward giving 25 people access to clean water for life. Your email will never be shared. 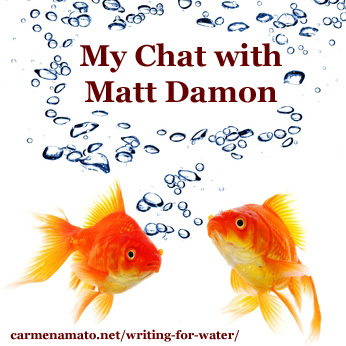 In 2014 I will donate $1 for each Kindle book sold to water.org, the charity co-founded by Matt Damon and Gary White to bring clean water and decent sanitation to communities worldwide. My little effort has expanded into the Writing for Water team of authors. The Water Diaries is a monthly series tracking our progress. Strong February book sales mean 2 more people get clean water for life! No doubt helped by the super folks behind The Fussy Librarian (Jeffrey) and The All Mystery Newsletter (Rebecca), book sales in February topped December 2013, which had been a very good month, and were more than double what they had been in January. It’s the readership that makes all the difference, of course, and if it wasn’t for engaged readers like you, no one would be getting clean water from our efforts. 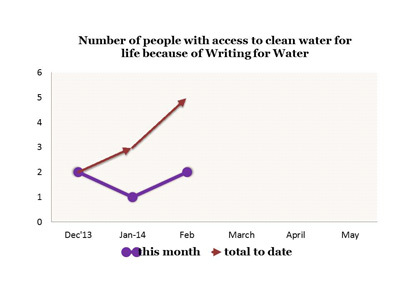 I’m tentatively setting a goal of providing 25 people with clean water for life from the Writing for Water effort. Throwing in December 2013 sales, the magic number so far is 5. If you have bought one of my books for your Kindle in the last 3 months, you have helped give 5 people in need access to clean water for life. If you love to read, check out one of the books from the other authors below and sign up for my monthly updates here (you’ll get a free Emilia Cruz mystery story for your very own) to join Rosemary in tracking our progress. Please tell your friends. Seriously. Take a minute and forward this blog post to a friend. Share it on Facebook. 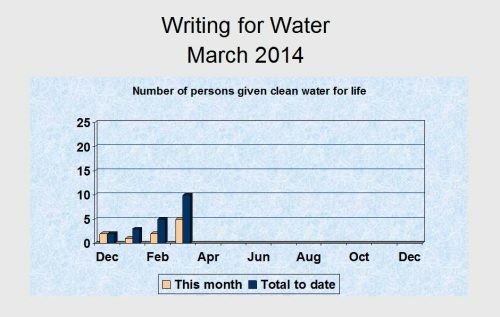 Retweet messages with the #WritingforWater and #Water=Life hashtags on Twitter. We need every retweet, Facebook share, and email forwarding possible. The more folks who know of our effort, the more likely it is that we can get water to those in need. And if you are an author who wants to make a difference, sign up here to join the team. Arkansas-based author Sharon Lee Johnson writes fun, entertaining stories across genres from traditional romance to paranormal romances to YA zombie tales. The women in her stories are strong and determined women who discover their destiny in this life. So whether you want paranormal or a sweet romance, Sharon writes them all. Canadian author and photographer Norm Hamilton’s debut novel is a compelling story about a dystopian Canada created by unrestricted gas fracking and irresponsible mining techniques. The novel throws new light on today’s concerns about the future of our environment. 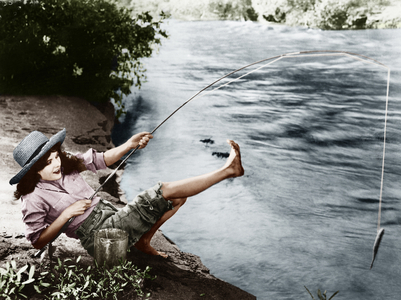 Norm’s other book will help hone your digital photography skills. 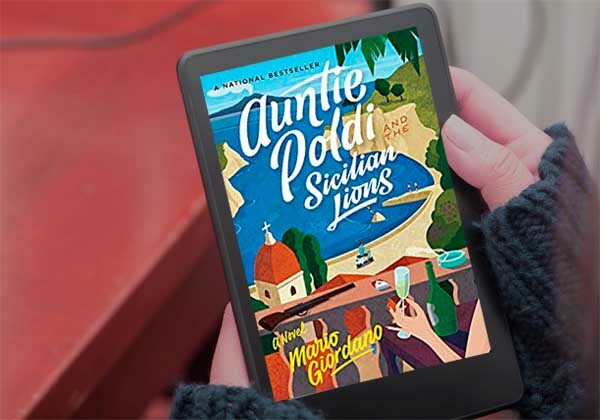 This California author of The Roger and Suzanne Mysteries incorporates a clever cast of characters and exotic locations to keep his growing fan base guessing whodunnit. From Uruguay to Chile to California, the books provide local color and a menu of regional specialty foods to die for. Pun intended. “Every 21 seconds a child under the age of 5 dies because he or she doesn’t have access to clean water,” Matt Damon told me. Matt Damon didn’t say anything else, probably because I was reading his interview about water.org in the February 2014 edition of InStyle magazine, and he was in Hollywood having a beer with Ben Affleck by the pool. But still, I felt a connection. I’d decided in May 2012 when I published my first book, THE HIDDEN LIGHT OF MEXICO CITY, that when I was able to tote up any book sales at all, I’d donate part of my earnings to water.org, the charity Matt Damon co-founded. I like water.org’s approach. They work with local communities and give microloans with a program called WaterCredit to communities so they can “meet specific drinking and sanitation needs.” This means they don’t pursue a one size fits all solution but support what is right for a community, based on that community’s situation. I surfed through their website and YouTube channel and knew that this was the right opportunity to give back. Water is fundamental; without it there is no education, no forward progress, no ability to break away from poverty and disease. January: how did we do? January 2014 marked the first month of my effort. Here’s the link to the fundraiser. I was joined by authors Sharon Lee Johnson and Melissa Mayberry. We didn’t have any particular sales target but simply cross promoted each other on social media. I also set up a page on my website to explain what I was doing and another to invite other authors to join in. Bottom line: combined with my donation from December 2013 sales, we raised enough to supply three people with clean water for life. A slow start, in all honesty, but accompanied by some very positive developments and some lessons learned. 1. I overestimated the amount I’d raise. January saw my lowest Kindle sales in 6 months (post-holiday slump? too little advertising? IDK). In future I’m going to limit the amount of the monthly target goal; I’d rather overshoot than be depressed at a goal that doesn’t get met month after month. 2. Fellow author Sharon Lee Johnson, who will showcase a different short story for water.org each month, has an amazing work ethic and deep well of optimism. When we traded notes at the end of January, instead of being bummed that we hadn’t raised more money, she was already looking ahead to the next step. Her sense of purpose and will to succeed are contagious! 3. Having a project hashtag is cool. I created the hashtag #WritingforWater and will use it all year. People on Twitter have been awesome, retweeting my notices about supporting water.org every day. One day @Water gave me a RT, really making me feel like part of the family. 5. Jerry Last, author of the Roger and Suzanne Mystery Series, will join as well this spring. Jerry’s a live wire on social media, not to mention a fellow dog lover and mystery writer, and his participation will really help out. I know I could be letting more people know what we are doing, beyond Facebook, Twitter, Pinterest, etc. Not ever having done something like this before, I’m not sure how to go about letting folks know and getting more authors to join the #WritingforWater Team. If you have an idea or would like to help, please get in touch: carmen@carmenamato.net. I couldn’t agree more. How about you?